Christmas is a time to celebrate the love and goodness of God for His grace in giving His Son for our salvation. It is a time for giving and receiving in the spirit of the Season. The message of Christmas is one of hope, peace and love. We send you our personal greetings at this time and we pray that God would enrich your lives over Christmas and into the New Year. "For to us a child is born, to us a son is given, and the government will be on his shoulders. And he will be called Wonderful Counsellor, Mighty God, Everlasting Father, the Prince of Peace." With our love, prayers, and many blessings for the year to come. 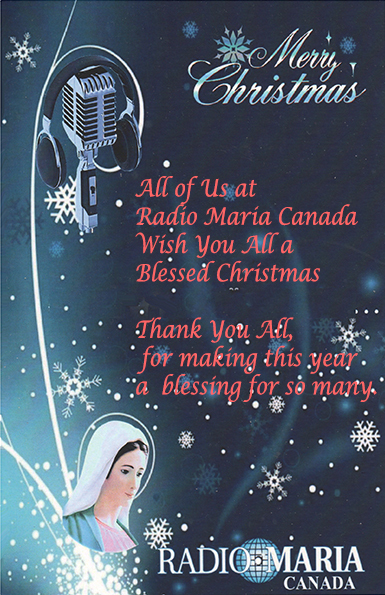 From All the Staff, Hosts and Volunteers of Radio Maria Canada.